US, 2009, 99 minutes, Colour. Jimmy Bennett, Gabriel Basso, Uriah Shelton, Clint Howard, John Goodman. Directed by Tim Mc Canlies. Alabama Moon is set in 1980. 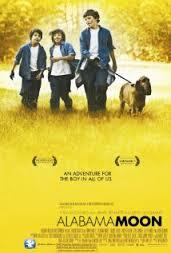 It focuses on a young boy, Moon Blake (Jimmy Bennett), who lives with his father, an environmentalist, out in the woods. When his father dies in an accident, the boy buries his father and decides to travel to Alaska where his father said he could be free. However, he encounters a local landowner, Mr Wellington (John Goodman) and is taken in by an erratic policeman, played by Clint Howard. He is put into an orphanage, makes friends with some of the boys, leads an escape and goes back to the woods. However, one of the boys who escapes needs his medicine, collapses and has to go to hospital. The other is older, and goes back to live with his alcoholic father. The policeman pursues the young boy and finally catches up with him. Mr Wellington is a lawyer and takes the case to court, condemns the policeman, finds some of the young boy’s relatives – providing a happy future for him. The film works quite well for a family audience, especially for a family with younger boys. John Goodman is always welcome on-screen. Clint Howard’s policeman is rather a caricature. Jimmy Bennett, who appeared in many films when he was quite young, is able to command the screen as Moon Blake. 1. A piece of Americana? 1980? The values of the 1970s, the beginnings of the green movement? Families moving out into the woods? 2. The Alabama settings, the woods, the river? The institution? The town? An authentic feel? The musical score? 3. The title – images of the moon throughout? The boy called Moon Blake? His being the centre of the story? His voice-over, his burying his father, explaining why they lived in the woods? The flashbacks to life with his father, their working together, gathering food, growing vegetables, selling them in the town? His father’s accident, his leg, the infection, his death? His bequeathing his heritage to his son? Advising him to avoid the government, the law, live free? 4. Moon, surviving after his father’s death and the burial? The meeting with Mr Wellington, the food, Mr Wellington calling the police? Constable Sanders and his brutal behaviour? 5. Moon going to the institution, his interview with the manager? The security guard? The security guard and his kindness? The clothes, the room? Meeting the other boys? The clash with Hal, Hal older and taller, taunting Moon, Moon head-butting him? Then offering him his bed so that he could have a good sleep while Moon preferred sleeping outside? At the table, his friendship with Kit? Life in the institution? 6. Hal, his attraction towards Rachael? Hal being friendly with Moon? Kit as a good friend? Rachael and the kitchen work? Moon and his decision to escape, his plan, inviting all the boys, the metal over the wire fence? Their all escaping, Hal driving the bus? In the woods, many of the boys wanting to go home, Rachael helping them? The three going into the woods, the danger with Kit’s lack of medicine? 7. Surviving in the woods? Hal and his going back to his father? Kit and Moon sharing the hunting, the exhilaration of fending for themselves? Kit and his illness, Moon dragging him towards the highway, his being picked up and taken to hospital? His illness, his death? 8. Moon and the confrontations with Sanders, eluding him, getting his gun, throwing it in the river? Kit and Moon trapping Sanders in the hole? Sanders and his relentless chasing of Moon? 9. Mr Wellington, Moon, Wellington’s apology? The police taking Moon to jail? Mr Wellington absent? 10. Moon getting dressed, going to the court, Sanders in the witness box, the evidence against him, the gun being found? Sanders’ lies and self-defence? Taking the money from the manager of the institution? The judge, his kind decisions, Mr Wellington finding the cousins, Moon being reunited with them? A happy family life? 11. Moon and the transformation, his admiration for his father, thinking that his father didn't always give him good advice, writing letters to his father and burning them as smoke signals for his father? The uncle and aunt, the cousins and their welcome? Moon not wanting to be alone? The appropriate happy ending?